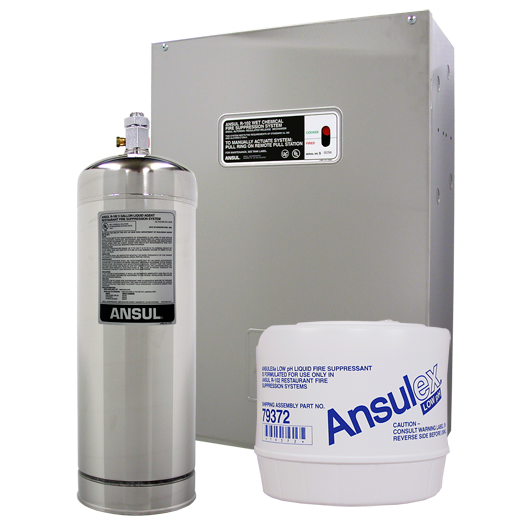 ANSUL products protect more food service kitchens from fire than any other brand. The R-102 Fire Suppression System incorporates a flexible design with an extremely effective ANSULEX Low pH Liquid Agent. ANSULEX quickly knocks down flames and cools hot surfaces, while generating a tough vapor securing blanket that helps prevent re-flash. The PIRANHA Dual Agent Restaurant Fire Suppression System employs the best firefighting attributes of two extinguishing agents: the fast flame knockdown and securing power of wet chemical and the fast cool-down capability of water. The system provides protection for settings such as casual and fine dining, fast food chains, culinary schools, sports complexes and stadiums, and four- and five-star lodging facilities.